The Vari-Chrome® Pro offers efficient selection of 5 pre-programmed settings to personalize therapy aimed improve the quality of life for people with pain and its associated impaired functions. The pre-programmed settings continuously vary the wavelength during therapy. A manual mode lets the practitioner select wavelengths throughout the visible spectrum (430-670nm) that remain steady during therapy. The frequency and intensity can also be adjusted at any time. 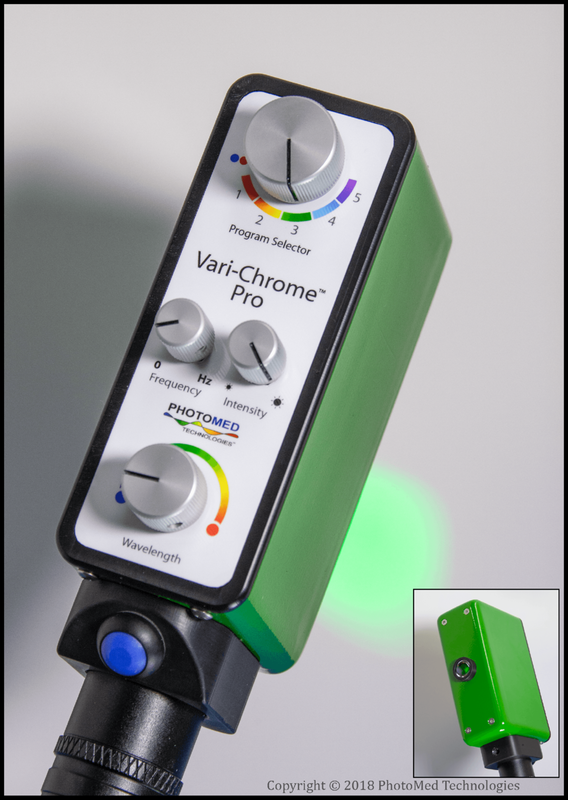 The Vari-Chrome® Pro is available only in the U.S. Please contact PhotoMed Technologies for information. Practitioner can now personalize therapy using different wavelengths via pre-programmed settings or manually select wavelengths that remain steady during therapy. The practitioner monitors for physiological responses that typically become objectively measurable during or within 60 seconds after an effective treatment. Access to more wavelengths increases the likelihood for improving the patient’s quality of life.